Many grant proposals require a plan for sustainability, carrying the expectation that a funded program will continue to be viable once the start-up resources have run out. This can be a challenging proposition for medical researchers, who have to run their interventions while identifying all direct and indirect financial benefits of their work. Drawing from his international research experience, Dr. J. Brian Cassel will discuss his approach to developing long-term funding modelsin palliative care, presenting universal considerations that could assist researchers in maintaining clinical and quality-improvement programs that expand access to care. 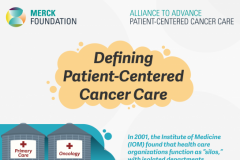 In this context, The Alliance to Advance Patient-Centered Cancer Care is hosting a webinar titled “Bridging Primary Care and Oncology in the Era of Patient-Centered Cancer Care: Challenges, Opportunities and Lessons Learned”, presented by Dr. Peairs of the Johns Hopkins Health Care & Surgery Center and Dr. Wallner of the University of Michigan. Leveraging their extensive clinical and ambulatory experience, they will present successful strategies and ongoing challenges in the integration of primary care and oncology care. Attendees will be able to present their own questions and interact with the hosts and other event participants. The live meeting is open to all researchers and practitioners eager to learn more about transition of care, improving cancer care delivery, and cancer survivorship. According to the American Medical Association, a patient navigator is someone who provides personal guidance to patients as they move through the health care system. Patient navigators may have professional medical, legal, financial, or administrative experience, or they may have personally faced health care-related challenges and want to help others who find themselves in similar situations. In 2017, the American Cancer Society (ACS) launched the National Navigation Roundtable, a collaboration of organizations dedicated to achieving health equity and access to quality care across the cancer continuum through effective patient navigation. The Alliance to Advance Patient Centered Cancer Care is proud to host Monica Dean, director of the National Navigation Roundtable at the American Cancer Society, who will be presenting a webinar titled “A Report from the National Navigation Roundtable: The State of Patient Navigation Today”. The event will feature a panel discussion with Dr. Sanja Percac-Lima of the Massachusetts General Hospital and Dr. Elizabeth Calhoun of the University of Arizona. Attendees will be able to present their own questions and interact with the hosts and other event participants. The live meeting is open to all professionals eager to learn more about the National Navigation Roundtable and patient navigation.